This is the free comic that all three publishers (I think) were giving out during last month's Stumptown Comics Festival, and as far as something like that goes, Nerd Burglar does the trick. There are a couple of engaging comics in here of the mostly throwaway variety; I liked best the efforts by Sarah Oleksyk and Elijah Brubaker. 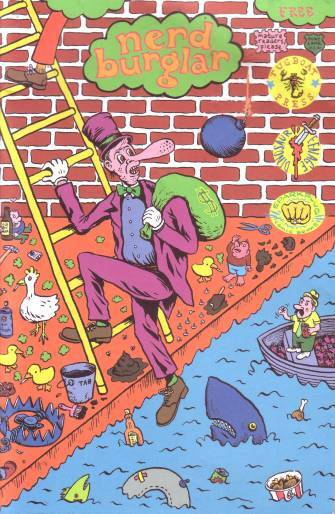 There are also one or two comics that make you look at the artist in a slightly different light. The cover by Chris Cilla has a wonderfully unfocused quality, while the pages by Aron Nels Steinke prove to be a welcome relief on one or two pages as opposed to the unrelenting quality they sometimes have in longer doses. 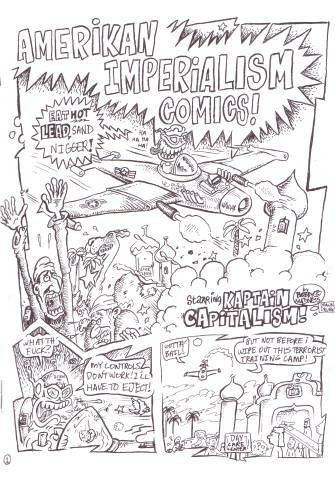 I would imagine, however, that most of the attention will be paid to Bobby Madness' "Amerikan Imperialism Comics!" The four-page satirical short marches the reader through a lurid, right-wing conception of the world tweaked only in one or two places to make it clear that what we're seeing is critical of the worldview rather than a celebration of it. It's a curious piece in that I can see many people feeling that it's obvious satire, while others might think it didn't go far enough in staking out that territory. I'm in the former camp, and my main objection is more along the lines that the satire itself is fairly toothless and crude without the energy that can come with exploring the obvious. The look of the piece contains enough old-school, second generation underground energy that I didn't notice until I was done the whole endeavor was light on calories.